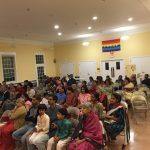 Boston GOD Satsang members celebrated MadhuraUtsav 2017 during the arrival of Sri Poornimaji to Boston. A 2-day program was organized in Acton on September 1st and 2nd 2017 at St Matthews United Methodist Church, Acton MA. 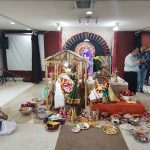 The event started with Mahamantra and prayer. The kids of Acton Gopakuteeram, then, enacted the story of Pundaleekan – emphasising values like “Mathru devo bhava, Pitru devo bhava” (parents are the foremost God) which are inculcated in the young minds via Gopakuteeram classes.The little children were as enthusiastic in the play as much as the audience were to watch them. 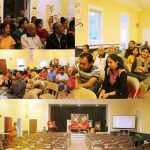 This was followed by Sri Poornimaji’s talk. 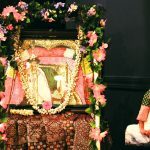 In the course of her talk, she emphasized that the qualities of humility, chanting of the divine name are the most important aspect of a bhakta. The story of Ambarisha from Srimad Bhagavatam was narrated beautifully narrated to drive home this fact. 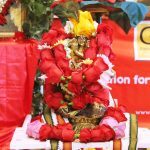 The second day of the event started with Mahamantra and prayer. This was followed by the solo dance performance of Saranya HariKrishnan, a student of Smt. Sangeetha Prasanna of Natya Rasika school of dance, who enjoys dancing for bhakti. She also danced for one of Sri Sri Swamijis compositions on Srinivasa – Ghambira Srinivasa. 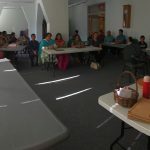 This was followed by Sri Poornimajis talk where she stressed the importance of Parayana of Srimad Bhagavatam and namakirtan. 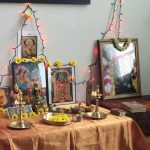 Narrating the life of Jatabharatha and Ajamila, she compared the path that each of them took and highlighted the importance of Namakirtan in this age of kali. 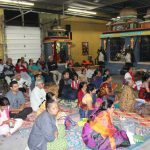 About 60+ devotees participated in the satsang.